Cylindrical aluminum alloy billets are heated to between 450ºC and 500ºC before being loaded into a container and then squeezed through a die shape using a ram with pressures of up to 680MPa. The die is supported by a series of back dies and bolsters so that the main press load is transferred to a front platen. On leaving the die the temperature of the section is more than 500ºC and with heat treatable alloys the quenching, or solution heat treatment, takes place in the production line. This can be by water bath, water spray or forced-draught air, with the latter being particularly useful for thin section. After extrusion, the section is guided down a table by a puller on to a slatted moving belt. Modern pullers are based on linear motor systems and operate on tables up to 40 meters long. On completion of an extruded length, the section is sheared at the press end and lifted from the slatted table by eccentric pivoted arms. It is then transferred by a walking beam or multi-belt transfer table to the stretcher bay where it is given a controlled stretch to straighten and remove minor miss-alignments. Dies can be made to form a virtually limitless array of shapes and sizes. 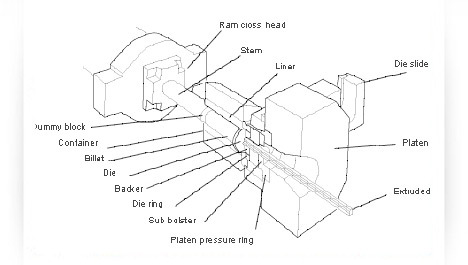 The die itself is a steel disk with an opening, the size and shape of the intended cross-section of the final extruded product, cut through it. Keili Metals does not charge for tooling die's based on our clients' custom profiles given any profile volume of 10,000 lbs annually. The actual extrusion process begins with billet, aluminum log cut to specific lengths which are fed into the press as extrusion materials. The billet must be softened by heat prior to extrusion. The heated billet is placed into the extrusion press, a powerful hydraulic device wherein a ram pushes a dummy block that forces the softened metal through the die. Once the shape of the final product has been identified, the proper alloy selected, and the die prepared, we are ready for the actual extrusion process. The process begins when the ram starts applying pressure to the billet within the billet container through the die. Various hydraulic press designs are capable of exerting anywhere from 100 tons to 15,000 tons of pressure. This pressure capacity of a press determines how large an extrusion it can produce. As pressure is first applied, the billet is crushed against the die, becoming shorter and wider until its expansion is restricted by full contact with the container walls. Then, as the pressure increases, the soft (but still solid) metal has no place else to go and begins to squeeze out through the shaped orifice of the die to emerge on the other side as a fully formed profile. A stretcher is utilized after the profile has been quenched to straighten the extrusion and correct any twisting that may have occurred subsequent to extrusion. Some extrusion alloys reach their optimal strength through the process of aging, sometimes known as age-hardening. Natural aging occurs at room temperature. Artificial aging takes place through controlled heating in an aging oven and is sometimes referred to as precipitation heat-treating. When the profile emerges from the press it is in a semi-solid state, but rapidly solidifies as it cools or is quenched (whether by air or water). Non-heat-treatable aluminum alloys derive their strength through natural aging and cold working. Heat-treatable alloys are further strengthened or hardened through controlled thermal treatments that affect the metallurgical structure of the alloys. Keili Metals delivers ‘container direct' from our mill facilities. A container holds between 38,000-44,000 lbs (17-20 tons), depending on the profiles being packed and accounting for airspace inside the container. We are flexible with packaging according to our client needs. We will wrap your profiles with plastic, interlay with cardboard, or any other protective packaging materials as specified; as well as bundle profiles in master and sub-bundles as small as necessary for easy handling.